We live in a culture that disdains grief. Forums include Death of a Child, Spouse, Sibling, Parent, Suicide and more. An abundance of articles on many aspects of grief including excerpts from Tom's writing. Articles will be added as we work on moving the site to the new format. The Honor Page was the internet's first memorial page started in 1995. It no longer accepts new entries but now has hundreds of people telling the story of their grief and loss. Tom's new book, The Way Men Heal is now available in Kindle and in paperback. 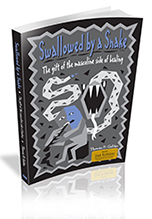 Tom's groundbreaking book Swallowed by a Snake: The Gift of the Masculine Side of Healing is also available in paperback and kindle. Tom does both phone or online consults via skype. Check here for more info. Oh, and LINKS!